Tens of thousands today crowded al-Mazzeh and 'Adnan al-Malki streets up to the Presidential Office in Rawda to show support for President Assad against the mounting US-pressures. 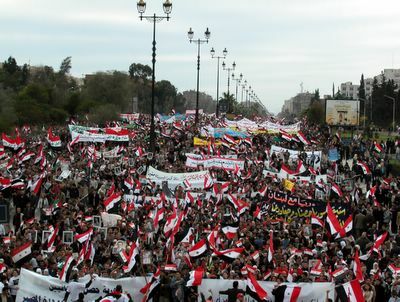 It was noted that unlike previous similar events, the Syrian flag dominated the rally and there were very few Baath Party flags (was this a good effect of the Beirut protests during which only the Lebanese flag was raised?) It was also noted that some people carried small placards saying: "Yes to reform and democracy in Syria" and calling for "Reform.. Democracy... Now!" but adding: "Support Our leader and Make a Better Syria" and "Mr Bush: We Need Our Democracy... Not Yours." The Arab countries and people deserve to have reform, democracy and civil rights. The best way to achieve this is gradually through evolution and internal change! There does not need to be foreign interference or invasions to impose this concept on the various Arab countries - I think that Arab people are intelligent enough to know what is good for themselves and Inshallah they will achieve their aims! How did you manage to get such a good view....were you on a balcony? And is this Mezzeh ? Yes, lack of Ba'ath party flags is a positive result. Syria need true political and economical reforms and no more obsolete slogans. 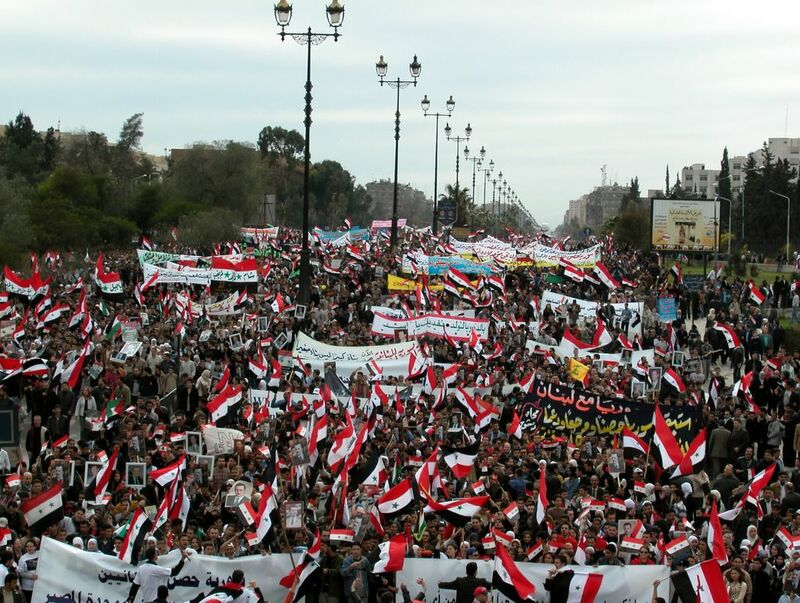 The syrian people is frightened because of the moukhabarati system and the regime fears losing its privileges. Our aim should be to break the vicious circle afflicting Syria. Syria need true political and economical reforms not false or hypocritical slogans. Our fist aim should be to break this vicious circle afflicting Syria. FIRSTLY, Bush claimed that he introduced democracy and free elections in Afghanistan (under US occupation). SECONDLY, Bush claimed that it was because of him that the Palestinians tasted democracy and had free and fair elections (under Israeli occupation). THIRDLY, Bush claimed that it was because of him and the 'allies' that the Iraqis had democracy and free and fair elections (under US & UK occupation). FOURTHLY, Bush is now claiming (that due to US and 'world pressure') that Lebanon will also have democracy and free and fair elections - following the pattern from above does this mean under US +/- Israeli occupation? I am afraid that the demonstration follows the same rusty USSR-like propaganda, despite the apparent "reform" calls. By the way, I agree with the prior post: nice pic Ayman! COME ON! do they think we are idiots? You can never LOGICALLY see "Reform.. Democracy... Now!" alongside with "Support Our leader and Make a Better Syria"! Ayman, you are wonderful man, but with all due respect, please stop being a reporter when things that should be said, or even implied, can never be. Just be a blogger, and you are a good one. Dear Anonymous @6:05, thanks for the comment but I didn't really get what you mean. I posted about things that caught my attention, without saying what I think about them. These were observations rather than opinions. Whether we like it or not, these placards were part of the "picture" and they were something new. The fact is clear that the vast majority of the people of Lebanon (who are actually Muslim - whether Shia or Sunni is totally irrelevant) actually support the presence of Syrian troops and the stability that it has brought to their country after the devastating civil war. Let me be frank and say that if there were TRUE fair and free elections in Lebanon then the Muslim parties would win most of the seats in parliament and in fact the PRESIDENT should be a MUSLIM (either Sunni or Shia - this is again irrelevant, the PRIME MINISTER should be a MUSLIM and the SPEAKER should be a CHRISTIAN. This would in fact reflect the TRUE demographics of Lebanon TODAY in this day and age not the old one imposed by French imperialism where the President is Christian, the Prime Minister is a 'Sunni' Muslim and the speaker is a 'Shia' Muslim. If Lebanon and the Lebanese truly want REAL (not delusional) democracy then this is how it should be. It is really only the Maronites and the Druze (who even together are a minority against the Muslims) who are supporting the 'inquilab al arz' which should really be called the 'inquilab al Gucci'. Note that I am NOT Syrian, Lebanese or Arab but an Ajami observer! I want to know how can the syrian citizen help Syria if he is under stifling supervision of the intelligence services apparatus and the martial law. The regime still refusing any reform in direction of the legitimate and elementary rights of the syrian citizens but opted for the endless concessions to satisfy the american demands and these american demands dont care about the human rights of connected to the strategic interests of Israel. The regime still refusing any reform in direction of the legitimate rights of the syrian citizens but opted for the endless concessions to satisfy the american demands and these demands dont care about the human rights of the Syrian people but are only connected to the strategic interests of Israel. Well, I recognize that I went a little overboard. I think I was just upset with the whole "political" scene. By the way, I also recognize that your post started getting attention from some haters weirdos, like the Anonymous @ 10:18 PM. It revisits the whole concepts of a true civil unity of different religious groups and, I think, calls for a discussion about whether there is a real tolerence of different religious groups with each others. It is true people should live free, and that goes for all. The youth of Syria are influencing change it is just taking longer than thought, we will get there inshallah. One thing we need to do better is act togeter as arabs and not selfish seperate countries, together we are strong, alone we are weak and exposed.